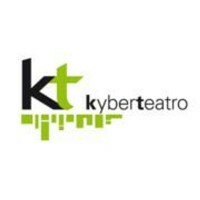 “Co-Interaction” is an Art group dedicated to the implementation of Hi-tech assisted artistic projects, composed by Svetoslav Kosev and Atanas Markov. Their new art installation, presented in Veliko Tarnovo on 15th March, is a natural corollary to two former interactive projects, namely “INTERACTIVE GENERATIVE FORMATIONS” and “VIRTUAL ARENA”. The essential difference between the new project and the previous ones is that in the former action takes place on a two-dimensional plane, on which images are being projected. The objects’ aesthetics is pre-defined and the movement of both viewers and participants in the installation is detected by a sensor. Thus, the viewers alter the appearance of the dynamic images on the go and become active part in their construction and perception. With the project “INTERACTION WITH A BIOBOT”, we leave the two-dimensional plane and venture into three-dimensional space. The dimensions of the installation “event box” are 500х500х350 см. While discussing the project we came up with the idea to imitate a living organism that is able to react to “the threat” of approaching viewers. This idea is modeled over a behavioral reaction of a group of plants depicted in the movie “Avatar”. In the movie the protagonist touches a plant which triggers an instant reaction by all other members of the group of plants which withdraw within their roots. To design an installation of the desired scale within the viewers’ step-in zone however is quite risky. That is why we decided to raise the whole installation and the objects above viewers’ heads, which, of course, is much more complicated as an engineering solution and necessitates the involvement of an expert in the respective field. The other problem that we had to solve concerned the nature of the object that was supposed to react to the participants’ presence and what type of reaction to model. It was at this point that I was reminded of a game children play on the beach. It involved throwing of a small spherical ball that expands in flight but contracts upon impact and squeeze. Later on it turned out that this toy was known in the scientific circles as the “Hoberman sphere”. We made a couple of experiments with “the ball” and it turned out that it can be made to expand and contract to pre-defined parameters with the aid of servo mechanisms. 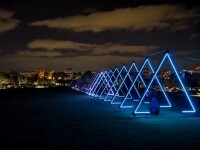 Then, on the basis of all the initially considered elements, the whole construction for the installation was designed. Naturally there were some problems within the process of construction. These were primarily related to the electronic circuits and Atanas had to solve them on the spot, which he masterfully did. All in all, our cooperation in which I contributed with the conceptual and the visual part, Atanas was entirely engaged with the technical part, and engineer Anton Krustev contributed with the construction design, lead to the completion of the project and the new installation. The opening took place on the 15th May 2014. Among the guests was Mr. Martin Ivanov - the President’s Secretary of Culture. Mr. Dincho Krastev – CEO of NALIS – and Mrs. Katya Zografova – director of the National Museum of Literature presented the exhibition and the EuropenaPhotography project. 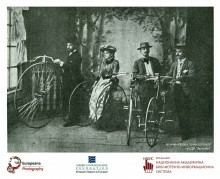 This year, the General Meeting of the NALIS Foundation is joined to the celebrations of the 125th anniversary of the Sofia University, and includes an important workshop: “Undisclosed Treasures from the Photo-archives”. Following the workshop there will be the official opening of an exhibition: “Treasures among the Donations to Library “Theology” of the Sofia University “St. Kliment Ohridski”. In the Humanities, Social Sciences, and Cultural Heritage communities there is increasing interest in and demand for NLP methods for semantic annotation, intelligent linking, discovery, querying, cleaning, and visualization of both primary and secondary data, which holds even for collections that are primarily non-textual, as text is also the pervasive medium used for metadata.